Many industrial and domestic water users are concerned about the hardness of their water. Hard water requires more soap and synthetic detergents for home laundry and washing, and contributes to scaling in boilers and industrial equipment. Hardness is caused by compounds of calcium and magnesium, and by a variety of other metals. General guidelines for classification of waters are: 0 to 60 mg/L (milligrams per liter) as calcium carbonate is classified as soft; 61 to 120 mg/L as moderately hard; 121 to 180 mg/L as hard; and more than 180 mg/L as very hard. Mean values of hardness at 344 stations during the 1975 water year are represented by the chart. The highest 7 values, those over 1,120 mg/L, are lumped in the last bar of the chart in order to maintain the scale. 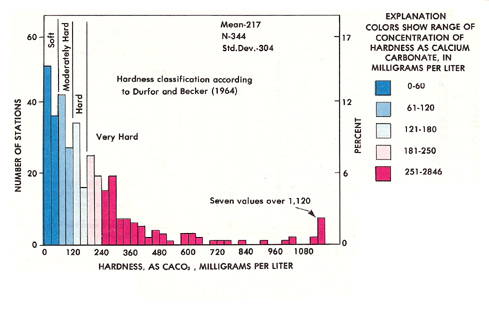 About half of the mean hardness values for the stations are in the soft to moderately hard categories, and about half can be classified as hard to very hard. Source: Briggs and others, 1977. Patterns of hardness in the United States are shown on the map of accounting units below. Softest waters were in parts of New England, the South Atlantic-Gulf States, the Pacific Northwest, and Hawaii. Moderately hard waters were common in many rivers of Alaska and Tennessee, in the Great Lakes region, and the Pacific Northwest. Moderately hard waters were common in many rivers of Alaska and Tennessee, the Great Lakes region, and the Pacific Northwest. Hard and very hard waters were found in some streams in most of the regions throughout the country. Hardest waters (greater than 1,000 mg/L) were measured in streams in Texas, New Mexico, Kansas, Arizona, and southern California. Mean hardness as calcium carbonate at NASQAN water-monitoring sites during the 1975 water year. Colors represent streamflow from the hydrologic-unit area. Mape edited by USEPA, 2005. Modified from Briggs and others, 1977. Water hardness is based on major-ion chemistry concentrations. Major-ion chemistry in ground water is relatively stable and generally does not change over time. Although the map illustrates data from 1975, these data have been found to be accurate and useful in current assessments. There are, however, several caveats about the nature, use, and interpretations of these data: (1) the data illustrated represent water hardness on a national and regional scale and must be so interpreted; (2) the 1975 data are not designed to be used to make local decisions or decisions on the scale of individual homeowner property; and (3) information that is directly relevant to water hardness and other chemical properties at a home or immediate locale should be provided by the local health agency, local water utility, or by the vendor of a local water-softening system. 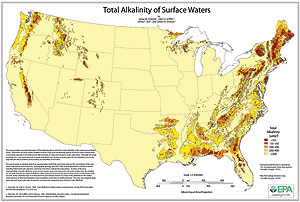 EPA's "Local Drinking Water Information"
The U.S. Environmental Protection Agency produced a map illustrating the regional patterns of mean annual alkalinity of surface water in the conterminous United States. The map provides a qualitative graphic overview to the sensitivity of surface waters to acidification. The map is based on data from approximately 2,500 streams and lakes and apparent spatial correlations between these data and macrowatershed characteristics, especially land use.